Back cover blurb: Antoinette Conway, the tough, abrasive detective from The Secret Place, is still on the Murder squad, but only just. She's partnered up with Stephen Moran now, and that's going well - but the rest of her working life isn't. Antoinette doesn't play well with others, and there's a vicious running campaign in the squad to get rid of her. She and Stephen pull a case that at first looks like a slam-dunk lovers' tiff, but gradually they realise there's more going on: someone on their own squad is trying to push them towards the obvious solution, away from nagging questions. They have to work out whether this is just an escalation in the drive to get rid of her - or whether there's something deeper and darker going on. 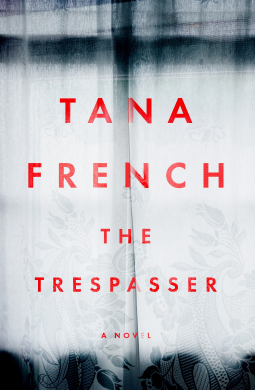 The Trespasser is another gem of a novel from Tana French. It features Detective Antoinette Conway and her colleague Stephen Moran and is the 7th novel in the 'Murder Squad' series, but can definitely be read as a stand alone novel. Shamefully this is only the second one of the series that I have read, and I really need to read the others! When a young woman is found dead in her home one morning after Conway and Moran have just finished their shift, suspicion immediately falls on the victims new boyfriend. Despite having just pulled an all nighter they are both pulled head first into the investigation. Instinctively they both realise that there is more to the case than first meets the eye. But there is pressure from above to charge the initial suspect and shut the case down. The only problem is, all the evidence is circumstantial. As Conway and Moran do a little investigation away from the prying eyes of their senior colleagues they are left reeling at what they discover, and left questioning everything they know and have ever been taught. Because if what they fear most is true, then where do they go from here? The Trespasser is a long character driven novel, with more focus on the investigation and the detectives rather than the murder victim as such, but if you are looking for a healthy dose of well written literary crime fiction, the this is definitely the novel for you. Definitely one of my favourites of this year. The Trespasser is available from 22 September 2016.